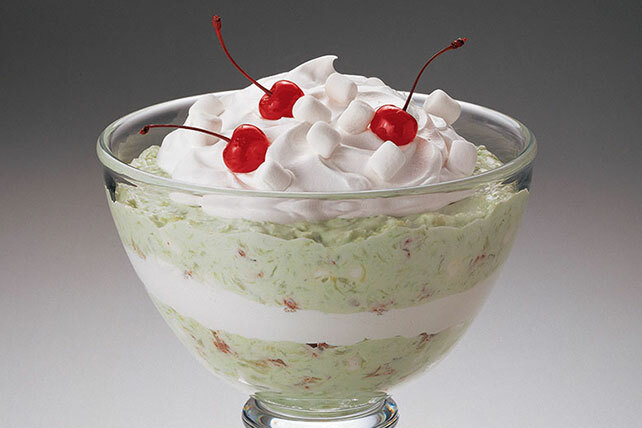 Pistachio pudding, pineapple and walnuts are layered with COOL WHIP and miniature marshmallows for a creamy and luscious layered dessert. Combine dry pudding mix, pineapple, nuts and 1 cup marshmallows in large bowl. Gently stir in 1 tub COOL WHIP. Add 2 cups of the remaining marshmallows to remaining COOL WHIP in separate bowl; mix lightly. Layer half each of the pudding mixture and marshmallow mixture in large serving bowl; repeat layers. Top with remaining marshmallows and cherries. Refrigerate 1 hour. Increase cherries to 16 cherries. Prepare as directed, layering pudding and marshmallow mixtures in 16 individual dessert dishes. Garnish each with a cherry.